“Clutter” is often seen as one big thing, but it is actually made of individual items. When your possessions become overwhelming, taking pictures of items connects you with their unique meaning, importance and value. Looking through the camera lens offers a new perspective. The goal is to take about 10 pictures a day for 6 weeks. Also, join The Focus Project Facebook Group to share your digital expressions, along with their stories, with others. Frame individual items with a camera for a new perspective. Through a lens, frame your individual belongings, whether an everyday item like a potato masher or a memory-laden photo. The focus of this project is seeing objects in a controlled depth of field. Look at your individual objects through a real camera lens or through your hands made into a frame. If you are distracted by the things in the background, make a portable studio with a towel or piece of fabric placed behind the object or over the things which surround it. As you continue to make pictures, you may appreciate the background clutter as you see it for what it is. Value an item in light of its meaning, home, and future. What value do you place on the item you are framing? In photography terms, there is light or exposure value (EV). The point of this project is to expose an individual items to light and to see its value to you in terms of the item itself, the space in which it sits, and the future that you want. To make the best picture possible, exposure matters. When looking at your things, you are being exposed to many different things about yourself. Your mind sees the usefulness in something, your hearts feels the memory and reacts, and your spirit sees a truth about yourself. Edit things to achieve an uncluttered life. When editing pictures, there are a few guidelines that let you get to the photos that matter. First, you get rid of any that are blurry or out of focus. Then you cull any that are unflattering to an individual. Similar photos? Choose the one that most matches your style and vision. A good collection will maintain interest and movement. When editing, rate the photos with 1 to 5 stars. Keep the 5's and let the 3's and below go. Similar to editing pictures, edit your things. Bring them into a space that contains them to tell your story, similar to the way photos are contained in an album. A good partner is empathetic, non-judgmental, and an excellent listener. "Show and Tell" allows a platform to share some stories behind objects and to interact with other people who are empathetic and understanding of your process. You are invited to tell about a single picture or a full mosaic. 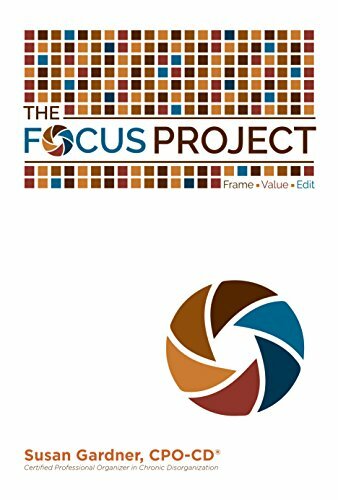 The point of The Focus Project is to see your things through a lens that strengthens your emotional, mental and physical well-being. You may upload a video or a picture at the Focus Project Facebook page, sharing as much or as little as you choose. The group that forms around The Focus Project will evolve as the community grows. One choice is a mosaic picture where the individual images are digitally made into a picture of your choosing. Go to picturemosaics.com to create an image and to share your picture. Share your titled image(s) on the Focus Project facebook page where you may tell the story of the collage or of a particular photo.